Fluffy Snow, Here We Go! Fluffy Snow, Here We Go! is the first level of World 5 in Yoshi's Woolly World. The level begins with a snowball and many Tap-Taps, leading to an area with a Wild Ptooie Piranha, a Piranha Plant, and more Tap-Taps. As Yoshi rolls the snowball even further, he will encounter more Piranha Plants, until it is impossible to move the snowball further. 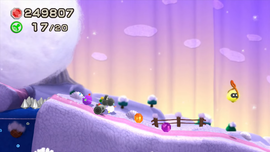 Yoshi will then approach a segment where he must use a Flooff to melt the ice blocks, then go past the first checkpoint. After taking the warp pipe, Yoshi will end up in a cave with many ice blocks, followed by an area with several Flooff-spitting warp pipes leading to the second checkpoint. Another warp pipe follows, along with a giant snowball chase that leads directly to the goal roulette. Smiley Flower 1: Enclosed in a wall of ice blocks above the first Wild Ptooie Piranha. To get it, Yoshi must push the snowball into the ice blocks, then throw a yarn ball at the Smiley Flower. Smiley Flower 2: Inside an ice block in the cave after the first checkpoint. Yoshi must spit out a fireball, either by a Flooff or by a Fire Watermelon to thaw it, then throw a yarn ball at it. Smiley Flower 3: In a Winged Cloud enclosed in a wall of ice blocks. Smiley Flower 4: Along a row of ice blocks during the giant snowball chase. Yoshi must consume some fire from a Flooff earlier on and spit out the flame at the wall to get the Smiley Flower. Smiley Flower 5: In a hidden Winged Cloud on top of the giant snowball at the end of the level. Wonder Wool 1: Inside a movable wall just before the first checkpoint. Wonder Wool 2: Near the end of the Moto Yoshi segment, at the top of a snowball. Wonder Wool 3: In the area with the Whirly Gate exit, Yoshi must enter the lower warp pipe on either side to enter an area with a Tap-Tap and a Present Box to obtain the Wonder Wool. Wonder Wool 4: Just after the Whirly Gate exit, in between two Flooff-spitting pipes. Yoshi must simply flutter jump to get it. Wonder Wool 5: On top of two ice blocks at the end of the snowball chase. 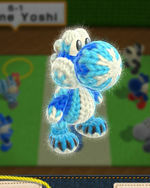 Collecting all of the Wonder Wools knits Alpine Yoshi back together. This level has a Whirly Gate that can be accessed through the second green warp pipe after the first checkpoint. It turns Yoshi into Moto Yoshi and cannot be reentered. This page was last edited on February 7, 2019, at 11:05.